The name says it all. Twice. In We Won't Pay! We Won't Pay!, by Italian playwright Dario Fo, a pair of pushed-to-the-limits housewives take part in a spontaneous act of social protest. Angry at the high price of making ends meet, they steal a bunch of groceries, smuggling them out of the grocery store beneath their sweaters, explaining their asymmetrical bulges by announcing that they are pregnant, thus baffling their husbands, who. Poor fellows, had no idea they were about to become fathers . . . to cans of vegetables. 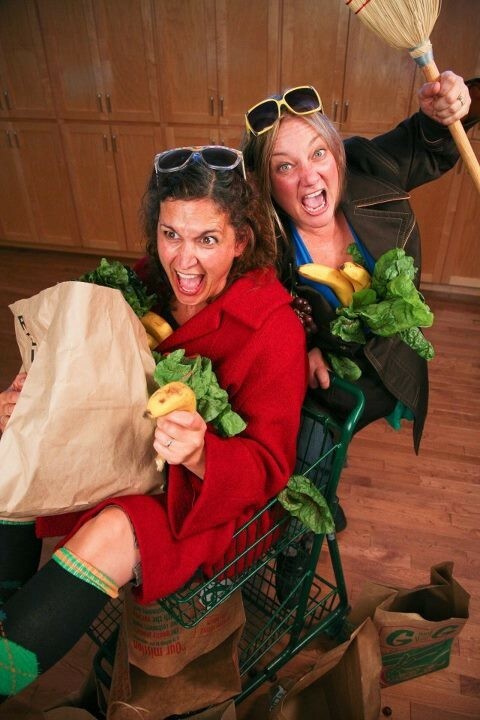 Opening this weekend at Cinnabar Theater, the outraged and outrageous comedy features Sarah McKehregan and Liz Jahren as the pilfering pair whose defiantly Marxist act of political theater leads to increasingly hilarious levels of misunderstanding. Fo blends elements of Commedia Del Arte with searing social commentary. Director Laura Jorgenson, who performed in the show as a young actress, now brings her years of acting experience to the play as director. It's politics colliding with comedy, making for an evening of serious fun. 'We Won’t Pay! We Won’t Pay!' runs Friday-Sunday through Oct. 7 at Cinnabar Theater. 3333 Petaluma Blvd. N., Petaluma. Friday-Saturday at 8pm; 2pm matinees on Sundays. $15-$25. 707.763.8920.